Goodreads: With the colonies at war and his country divided, Hamilton Lightfoot must choose sides: Fight for the British Crown or for the Independence of America. But after witnessing the death of his family at the hands of redcoats, he fears he’ll fight for revenge instead of honor. On the verge of a great battle, he pens a letter to Esther, the woman he loves. Esther Longfellow is in love with Hamilton, but her father is a loyalist, living in upcountry South Carolina and working for a wealthy British lord. When the Revolutionary War comes to her doorstep she is forced to choose between devotion to her father and her love for Hamilton. Chloe Daschle is the daughter of Hollywood royalty—a great director and an Oscar-winning actress. Yet her career has taken an unexpected turn: She’s the queen of death scenes. Trying to break out, she accepts a supporting role in a revolutionary war film. But she longs for the perfect role and the perfect real-life romance. Does happily ever after only exist in the movies? After a life-changing tragedy, MIT graduate Jesse Gates decides to leave his life behind and move to LA to try his hand at acting and screenwriting. When he finds a page from one of his ancestor’s letters, he becomes consumed with the love he finds there. Determined to help his grandfather find happiness at the end of his life, Jesse writes and sells a screenplay based on the events surrounding the lost love of previous generations. When Jesse meets the woman he has cast to play Esther Longfellow—his grandfather’s one true love—the stories of all four collide across time and space. 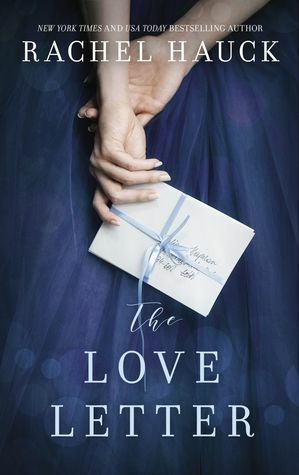 The love letter from the past might have more power to affect the future than any of them could have imagined. Kritters Thoughts: I sit on the fence often when I read Rachel Hauck. Her books have such great plot and story and characters but I am aware they are in the Christian fiction genre they just seem to be a little heavy handed in that area. I am not naive in that I know going into a Christian fiction book that there will be elements of the faith in the book, but I like them to be a little more subtle if I were wanting to give this book to someone and slowly introducing them to the faith, this would not be the book I would recommend. At the same time, I love the story and the plot. I love the dual storylines that clearly are connected from page one. But got even more connected as the story progresses. I loved Chloe and Jesse. Their story was interesting and kept me hooked on the book. I loved the inside peek into Hollywood and how they were both connected to the industry in different ways. It was also interesting to see inside a filming set and schedule - I know its fiction, but it felt based in reality just a bit! I enjoy Rachel Hauck, but I am hesitant to recommend her to any reader. There is a big asterisk I give when talking about her to other readers. She is definitely in the Christian fiction lane, but if you enjoy a good plot and characters with some Christianity, then you could enjoy her books too.